Debuting in 2002, the Pilot is known as Honda’s largest SUV offering. It is also one of the vehicles credited with popularizing midsize crossover SUVs with three rows of seats. The starting MSRP for the 2016 Honda Pilot ranges from $30,145 to $46,570. The 2016 model year kicks off the nameplate’s third generation of production, giving the Pilot a much-needed refresh. It is available in five trims: LX, EX, EX-L, Touring, and Elite. As a midsize crossover SUV, the 2016 Honda Pilot is one of the most spacious vehicles in its class. Accompanying the three rows of seats—which can seat up to eight people—is a maximum passenger volume of 153.1 cubic feet. 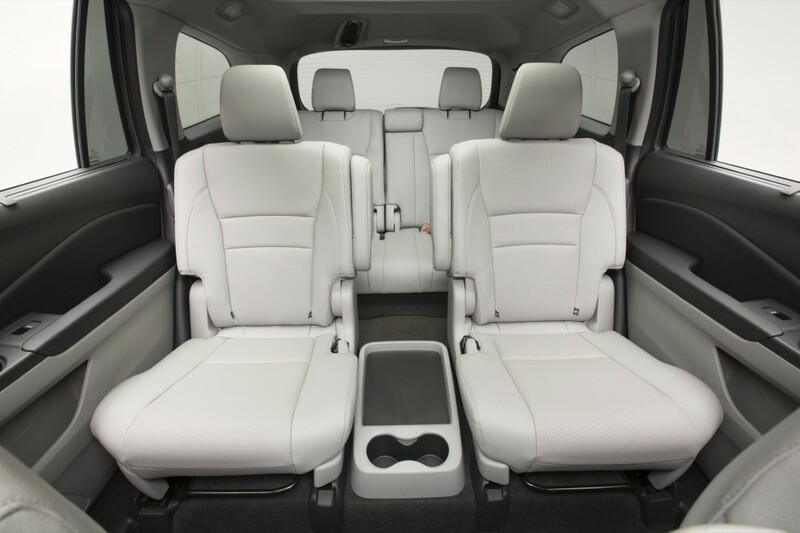 And with the ability to fold down the second- and third-row seats, you can expand the cargo space up to an astounding 109 cubic feet. 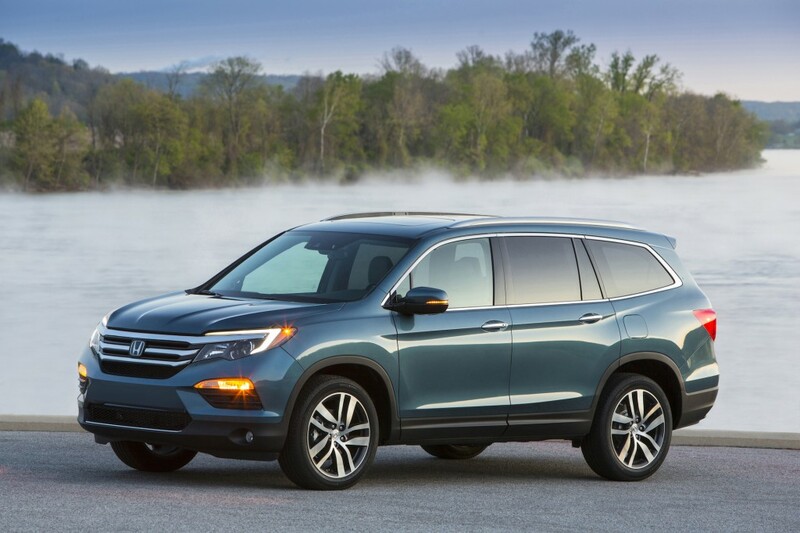 The LX, EX, and EX-L trims of the 2016 Honda Pilot have their engine linked to a 6-speed automatic transmission, while the Touring and Elite have a 9-speed automatic transmission with paddle shifters for simulating the manual gearbox experience. The vehicle’s regular front-wheel drive (2WD) is refined to handle driving in the snow, while the optional Intelligent Variable Torque Management (i-VTM4) all-wheel drive (AWD) system expands such traction capability to sand and mud. Towing capacity is measured at 3,500 lbs with the 2WD and 5,000 lbs with AWD. And depending on powertrain and drivetrain configuration, you can get up to 20/27 mpg in fuel economy, which is more impressive than most of the Pilot’s rivals can offer. The 2016 Honda Pilot uses a unibody construction for more structural integrity, rather than relying on putting together piece after piece. Overall, the new Pilot is larger than ever before, with more reliance of mild- to ultra-high-strength steel to minimize repair costs. Although its overall dimensions are larger, it actually weighs less than the previous-generation model—with noise, vibration, and harshness considerably reduced. Its independent suspension—consisting of MacPherson struts in the front and a multi-link design in the back—admirably absorbs road turbulence, and the electric power-assisted rack-and-pinion steering provide composed and responsive handling, considering its size. Plus, power-assisted disc brakes with ABS ensure that you stop at short distances and the wheels never lock up. The 2016 Honda Pilot rides on 18-inch alloy wheels with the LX, 18-inch alloy ones with the EX trim level, and 20-inch machine-faced alloy ones with the Touring and Elite. At the base level, one-touch turn indicators on the power side mirrors and multi-reflector halogen headlights with auto-off capability are standard. However, an auto-on headlight feature is extended to the trims above the LX—in addition to fog lights, smart entry, and programmable remote entry. Upgrading to at least the EX-L adds a power moon roof and tailgate, and roof rails and front and rear parking sensors are added on the top-tier Touring and Elite. The Elite in particular exchanges the halogen headlights and turn indicators with longer-lasting LED ones, gets additional auto high beams, and it is the only trim with heating capability on the side mirrors as a standard feature. Ten-way power adjustment and lumbar support on the driver’s seat are added on the EX; and leather seating surfaces, front-seat heating capability, and 4-way power adjustability on the passenger seat are added on the EX-L. A two-position memory system for the driver’s seat goes on the Touring and the Elite, with the latter also getting cooling capability and perforation on the front seats. For comfort and convenience, the 2016 Pilot, at least at the base level, comes with push-button engine start, cruise control, illuminated steering wheel-mounted controls, Bluetooth connectivity, a 4.2-inch color LCD screen for multi-information display, and a 7-speaker stereo system with 5-inch color LCD screen. Upgrade to the EX to get additions like tri-zone automatic climate control, remote garage-door opener, 8-inch high-resolution screen, SiriusXM satellite radio, and HondaLink in-car connectivity. A rear Blu-ray-based entertainment system is installed on the Touring and Elite, with an HDMI port at the second row; and they stand out with the standard Honda satellite-linked navigation system. The Elite is unique with its HD Radio and 10-speaker 540-watt sound system. First appearing at the Chicago Auto Show in February 2015 and made available for sale four months later, the 2016 Honda Pilot looks sleeker than ever, making previous iterations appear boxier by comparison. The 3.5-liter 24-valve i-VTEC V6 on previous models has now been revised to produce 280 horsepower and 262 lb-ft of torque. Designed as a powerful, direct-injection engine, the Pilot’s V6 includes Active Noise Cancellation (ANC) to reduce cabin noise, an Active Control Engine Mount (ACM) system for reducing vibration, and Variable Cylinder Management (VCM) and ECO Assist systems for improving fuel efficiency. In terms of safety, the 2016 Honda Pilot comes with front impact airbags, front seat-mounted airbags, and side curtain airbags that flank all rows of seats for head protection of all occupants. Also standard are a multi-view rearview camera for optimizing monitoring when reversing the vehicle; and Vehicle Stability Assist with Traction Control for ensuring that you keep your Pilot in control in less-than-favorable road and weather conditions. Honda LaneWatch is standard once you go up to the EX; and lane keeping assist, collision mitigation braking, and road departure mitigation systems are added on the Touring and Elite. Exclusive to the top-level Elite trim is blind spot monitoring with a rear cross-traffic monitor. The 2016 Pilot is acclaimed for its high level of safety; the Insurance Institute for Highway Safety (IIHS) named it a 2016 Top Safety Pick +, its highest honor. Similarly, the National Highway Traffic Safety Administration (NHTSA) gave it a perfect 5-star rating. Based on its aforementioned attributes, U.S. News & World Report — a publication that aggregates reviews and rankings from the automotive industry — showers the 2016 Honda Pilot with several honors. The publication names it the #1 vehicle in its Midsize SUVs, SUVs with 3 Rows, and Crossover SUVs categories. The 2016 Pilot is also the recipient of the publication’s 2016 Best 3-Row SUV for the Money and 2016 Best 3-Row SUV for Families awards, thus making it regarded as a vehicle of great versatility and overall value. Thinking of buying a Honda Pilot? Already own one? Leave a comment and let us know what you think!